NVIDIA'S next generation graphics card was a long time coming but provides oodles of performance without whacking your wallet. Mesh has always been one of the first out the tech barn with bleeding edge hardware to make PCs turn tricks on a budget. Now Mesh has done it again with its Elite GTX 460 – a budget gaming system powered by NVIDIA's belated mid-range GTX 460 graphics card. The Mesh Elite GTX-460 packs in excellent performance considering it's only £800 - with accessories. It comes in a solid but light Thermalake case with a big handle on top so you fraggerati lovers can carry it easily at LAN parties. It's also roomy inside for upgrade space with enough room for more memory and spare hard drives or DVD drives. You'll definitely need to upgrade to a Blu-ray player if you want HD playback – this only has one multi-format DVD drive. Shame because there's enough pizang to cope with HD and optional 24-inch HD Iiyama Prolite E2410HDSD does admirable work for budget flat panel. On the outside you get a whopping ten USB portsthat you'll never find time to fill with gadgets and an aSATA for external storage at the top front. It also looks neat and tidy internally and comes in any colour as long as it's black. Specs are ace for mid-rig gaming. 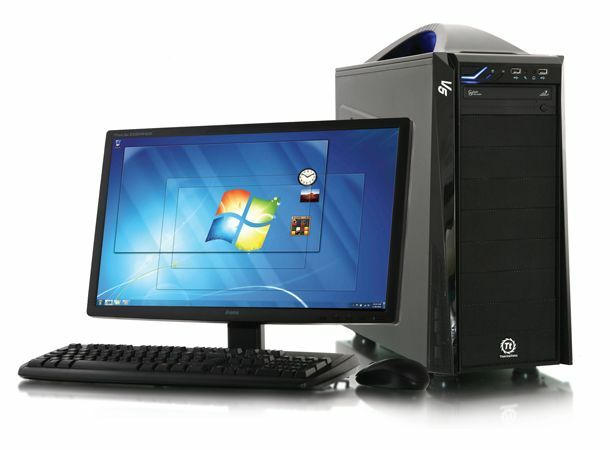 It has Windows 7 Home Premium (64-bit), an Intel Core i5 processor, 4GB of memory, a huge 1TB of storage and 1GB of graphics glory on the GTX-460 card. If that weren't enough, Mesh has also over clocked the specs to eek out as much performance as possible, cranking the 2.6GHz processor to 3.6GHz. Our test unit did have an overclock failure, but we re-installed Windows and reset defaults and didn't have any more problems. Fire up the frame rate sucking Crysis Warhead and the GTX 460 is a solid performer. We got 45fps at 1280x760 and 25fps at 1920x1080 and increased that to 31fps when turned off some advance features. If it can manage that, it could take on any next gen gaming title you might want to play. But the bottom line is this - this mother can play Crysis in HD with solid frame rates for well under a grand. Bring it on.